I’ve been restocking my pantry with tomato puree, a simple base of crushed canned tomatoes – smooth and chunky – that will serve as a base for stews, sauces, and soups until next year’s crop is upon us. Despite the abundance of fruit on the vine, this has not been as stellar a growing season for tomatoes as it once looked. Still abundant at our CSA, but picked just when the color starts to break from green to pink, ripening tomatoes occupy horizontal surfaces throughout our house, until I amass enough to can. This weekend, I made two batches of puree – one with Plum Dandy sauce tomatoes and the other with an heirloom variety called Amish Paste. One had a few onions and garlic added and the other some sliced shallots for flavor but neither puree is intended to be used straight from the jar. 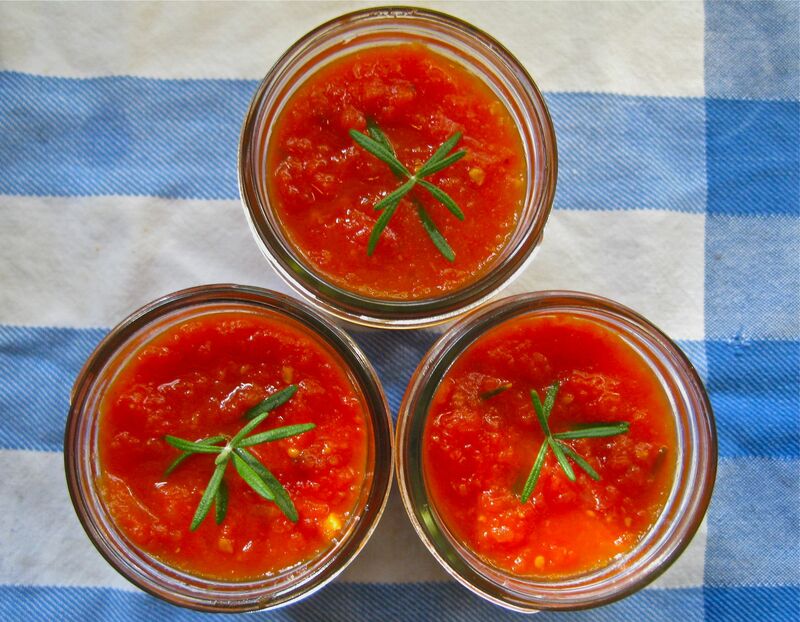 I have three basic approaches to canning tomato puree, and I adjust them according to the type of tomato, intended result and the amount of time I want to spend in the kitchen at one time. In one case, I peel the tomatoes assembly-line fashion, remove the seeds and excess juice (saving it to drink of course), salt them and let them sit for two hours before proceeding with the sauce. The second way is to peel and seed them and cook them right away, skimming the excess liquid that is exuded at the beginning, which I also can. The skim makes a great broth to start a soup or stew or to use as the basis for risotto. The third way is to cook the tomatoes with skins and seeds and all and pass the cooked mixture through a food mill. A less refined result but certainly the least labor-intensive. I don’t add a lot of extra ingredients since, as I said, these purees are meant to be used as a base for other dishes. However, this weekend, I set aside about four cups of puree to make into a finished sauce that is worthy to use as is. Redolent of the aromas of Provence, the sauce included garlic, rosemary, orange zest and orange juice. There’s not enough extra stuff in the mix to alter the pH and make it unsafe to can. In any case, I add bottled lemon juice to each jar to be on the safe side (1½ tsp per half-pint, 1 tbsp per pint and 2 tbsp per quart). If your prepared puree is chunky, puree it until smooth, using an immersion blender or food processor. Gently cook the garlic in a small amount of olive oil until translucent and fragrant. Add the tomato puree, orange zest and juice and rosemary leaves. Add salt and pepper to taste. Cook gently for about 10 minutes to allow the flavors to meld. Add lemon juice to the prepared (hot) jars. Use 1½ tsp per half-pint jar. Ladle in the hot tomato sauce, leaving ½ headspace. Add a tiny sprig of rosemary to each jar, pushing it down into the center, Insert a knife into each jar to release any air bubbles. Clean the rims and cap with lids and screw bands that have been dropped into boiling water. Process in a water bath canner for 20 minutes (for half-pints) after the water comes to a boil. Turn off the heat, remove the canner lid and let sit for 5 minutes before removing to let cool, undisturbed. Make sure the lids have sealed. Store in a cool dark place and use within a year. Peel, seed and drain the tomatoes. The following sounds like a lot of effort, but by working methodically in this manner, I can easily peel and seed six pounds of tomatoes in 15 minutes after the water comes to a boil. Bring a large pot of water to boil and set a second large pot in the sink, filling it with ice water. Place a large cutting board (preferably with a groove to catch liquid, as you would use for carving meat) next to the sink. Have a small paring knife and a larger cutting knife handy. Place sieves on top of two bowls (one large and one small) in front of the cutting board. Using a large slotted spoon or skimmer, plunge the tomatoes, a few at a time, into the boiling water and remove them to the ice water. Using the paring knife, cut out the core and slip off the skin. (Some people cut x’s in the bottom of their tomatoes before placing them in the boiling water. This is a waste of time since you’re cutting out the stem end and all you want to do is pierce the skin to make it easy to remove.) Cut each skinned tomato in half crosswise and set it on its side on the cutting board. Working over the small sieve, remove the seeds and liquid from the cut tomatoes, letting the seeds sit in the sieve and liquid drain through. Place each seeded tomato cut side down, so that you know it’s done. When you’re finished seeding the tomatoes, chop them coarsely using the large knife and place them in the large sieve. Sprinkle with salt and let them drain for about 2 hours. Combine the juice from the seeding and draining and drink it (or alternatively, use it as the base for canning whole tomatoes). Process the puree in a water bath canner. 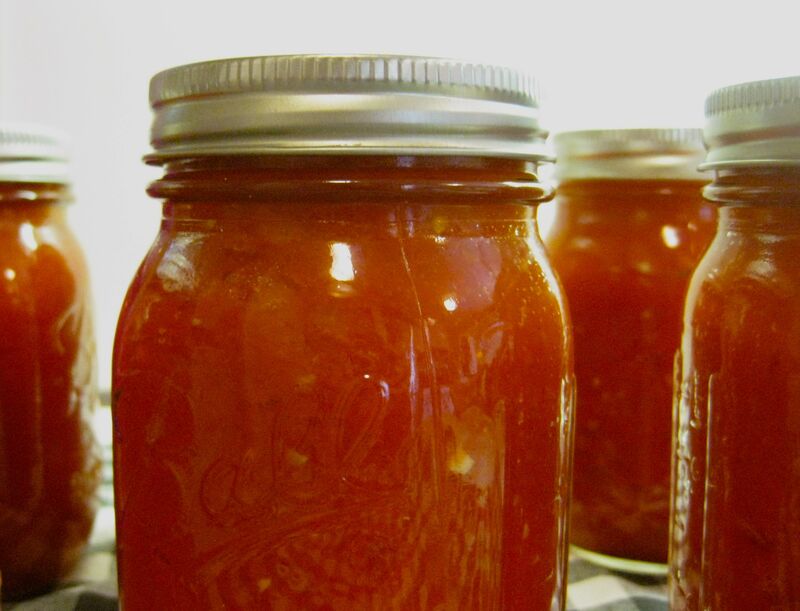 While the tomato sauce is cooking, prepare jars for water bath canning. When ready, add bottled lemon juice (to control acidity and prevent rot) to each jar. Use 1½ tsp per half-pint, 1 tbsp per pint and 2 tbsp per quart. Ladle in the tomato puree, leaving ½-inch headroom (a little more in the large jars). Clean the rims and cap with lids and screw bands that have been dropped into boiling water. Process in a water bath canner for 20 minutes for half-pints, 35 for pints and 40 for quarts, timed after the water comes to a boil. Turn off the heat, remove the canner lid and let sit for 5 minutes before removing to let cool, undisturbed. Make sure the lids have sealed. Store in a cool dark place and use within a year. Makes 4-5 pints, but will depend on the meatiness of the tomatoes and how they condense when cooked.